Former Sri Lanka captain Marvan Atapattu was one of the most technically sound batsman that Sri Lanka has ever produced. From the early Test era of Sri Lanka, Atapattu earned a prominent place when it came to technicality after Sidath Wettimuny, Ranjan Madugalle, Roshan Mahanama and Hashan Tillekeratne. The ever popular Observer-Mobitel Schoolboy Cricketer of The Year 2019 contest has reached its final lap with the commencement of the all important first term inter-school cricket matches. 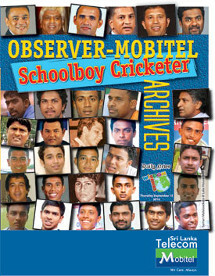 Thus, the voting for the 41st Observer-Mobitel Most Popular Schoolboy Cricketer of The Year 2019 competition will gather momentum with coupons appearing in the Sunday Observer, Daily News, Dinamina and Thinakaran. Trinity College spinner Kavishka Senadeera captured a match bag of 11 wickets for 83 as his team beat Nalanda College by 47 runs in the inaugural cricket encounter for the Mahela-Sanga Challenge Trophy at Campbell Place last weekend. Senadeera claimed 5 for 52 and 6 for 31 in the two innings of Nalanda in a low scoring game. Kalana Madhusanka skipper of Seethawaka National School Avissawella took the spotlight this week by becoming the first batsman to pass the 1000 runs milestone this season in the Under-19 schools cricket season. Right handed batsman Kalana Madhusanka has scored 1161 runs from 10 innings with three double tons and three tons. He is the first batsman to score three double tons in the same season. The Mobitel Observer Cricketer of the Year awards this year moves into a new chapter with the interest shifting to looking at ways to award the girls who perform well this season. This will also encourage them to commit themselves wholeheartedly to the game. A total of 36 girls schools are fielding teams in the under-19 tournament divided into seven groups. The knock-out final round enabled 18 teams to qualify.